Turkmenistan was not expected to have much trouble with Kuwait, but the dominant display the Central Asian team put on surpassed all expectation. Eight goals in the first period, seven in the second and nine in the third made 24 in total for Turkmenistan, with Kuwait scoring twice in the third period after the game was well in hand. Captain Ahmet Gurbanov racked up four goals and four assists in the game, with Aleksandr Vahovskiy, Arslan Geldimyradov, Dovlut Soyunov, Ishan Veleyev and Nikita Avdeyev also recording hat-tricks. In the nightcap, Bosnia and Herzegovina needed a win against the UAE to keep pace with Turkmenistan and did so with a 5-1 win, but it wasn’t easy. Amar Hadzihasanovic opened the scoring at 4:48 but, despite dominating the first period, that was the only goal for the Bosnians. Then, early in the second period, captain Juma Al Dhaheri tied the game with a brilliant individual effort in which he undressed a Bosnian defenceman and the goalie. Less than five minutes later, though, Bosnia’s captain answered when Dino Cordalija intercepted a pass in the UAE zone and fired the eventual game-winning goal on a blistering slapper while shorthanded. “We were superior physically and superior mentally, but sometimes it takes a catalyst to get the boys going and once they get their confidence, they get on a roll,” said Bosnian coach Brian Jokat. Less than two minutes after that, Mirza Omer put the hosts up by two with a nice goal of his own, going inside-out and firing top shelf. In the third, Cordalija scored twice more to complete his hat-trick. On the tournament’s final day on Wednesday, two ties will be broken. First off, either Kuwait or the United Arab Emirates will get their first win. History favours the UAE, who have won all previous meetings against their Middle-Eastern rivals. Then the final game will decide which team advances to Division III of the World Championships. “It’s the last game and we’ve got a day off to prepare, so we’ll talk a little bit about what happened today and try as best we can to finish on a high note,” said Arnost. Bosnia’s 5-0 goal vs Kuwait. They eventually won 8-1. In the win, the Bosnians got two goals from captain Dino Cordalija in the first period, then broke the game open with three power-play goals in the second period – two of which coming on Salem Alajmi’s major penalty for slashing. The Bosnians scored four power-play goals altogether and Mirza Omer led they scoring parade with two goals and two assists. “That’s the best we’ve played defensively in any game so far and our big guns scored the goals when they needed to, so that made me very happy,” said Bosnian head coach Brian Jokat. With the score 8-0, Kuwaiti captain Mohammad Alajmi broke Edis Pribisic’s shutout by scoring on a breakaway with 3:23 left to play. An enthusiastic gathering of 1100 cheered the home team to victory. 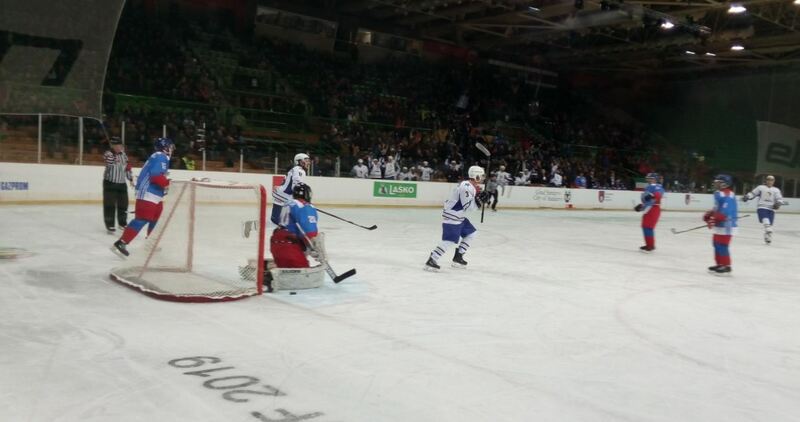 This was the first time an independent Bosnia and Herzegovina has ever hosted an IIHF event and the first time the Juan Antonio Samaranch Olympic Arena had hosted since the 1984 Winter Olympics, when Sarajevo was part of Yugoslavia. Earlier in the day, Turkmenistan was just as dominant against the United Arab Emirates with a decisive edge in play and a 40-10 shots advantage overall, but it took them until the 35th minute before Ilyas Veliyev finally got them on the board. They added three more goals in the third period for the 4-0 win, with Keremli Charyyev picking up the shutout. Alexander Vahovskiy and Amangeldi Aganiyazov collected two points each. Bosnia and Turkmenistan will now switch opponents on Monday, with Turkmenistan facing Kuwait in the early game and the UAE facing the hosts later on. If they both win again, they will face each other on Wednesday with advancement to Division III on the line. “We’ve got stronger competition coming up and we’ve got a couple guys banged up, so we’ve gotta get some rest and we’ll be ready to go tomorrow,” said Jokat, looking ahead. Bahrain’s third National Ice Hockey League is underway as the Riffa Maple Leafs prepare to take on the Isa Town Oilers on Tuesday (February 27) at 9pm followed by a clash between the Muharraq Predators and the Manama Capitals at 10pm at the Funland Ice Rink in Manama. The league, sponsored by DHL in its third edition, started in 2013 and consists of four teams of Bahraini and non-Bahraini ice hockey players all vying for the league’s trophy, which continues until mid-April. Although the Kingdom’s temperatures may reach boiling points during the summer, the group of 30 dedicated men still put on their heavy gear every week, grab their sticks and get onto the Ice rink united by their love for the contact sport. “I was always passionate about Ice Hockey since I was a child whenever I watched it on television because I felt it combines three sports into one, it had football, sliding and also fighting,” said 40 year-old Bahrain Sharks Ice Hockey Team founder and manager Tamer Fakhro. He was speaking to the GDN on the side-lines of a training session as he sharpened the steel blade on his ice skates. “When I was five years old I thought it would be impossible to play Ice Hockey in Bahrain and it felt like such a far dream to reach in the back of my head,” he said. Mr Fakhro has been playing ice hockey since 1993, and even though he took a break for five years during his college education in Cairo, his passion for the sport never stopped. Although the sport was mostly practiced by expatriates at the time, Mr Fakhro dedicated himself over the years and achieved captaincy in 2009. “I couldn’t believe it when former captain Andre Cote passed the captaincy down to me because he must have seen something in me that I didn’t know was there,” he added. Mr Fakhro received three Most Valuable Player (MVP) awards during his hockey career, and has competed, along with his team, in several regional competitions where they were named champions in a few. One of the first regional games the team played took place in Kuwait in 2010, where a random act of kindness carried out by Mr Fakhro further fuelled his passion and dedication to the sport. “This was our chance to show them that there is a team playing the sport in Bahrain, even though we just got together as a team a month ago and did not have the appropriate training facilities,” he added. Despite Mr Fakhro’s initial hesitation about participating in the game, the team got into their cars and drove to Kuwait to play the match. During the game, the Kuwaiti team captain was injured in the third period and as the captain of the Bahrain team Mr Fakhro aided him in getting off the ice and onto the bench for treatment. That sparked a positive response from the Kuwaiti audience who unusually started to cheer on the Bahraini team members. Mr Fakhro praised and thanked the efforts of DHL Bahrain and DHL Express Middle East and North Africa chief executive officer Nour Suliman for his support and partnership with the Bahrain Sharks and Bahrain Ice Hockey League. Bahrain Sharks goal keeper, 26 year-old Abdullah Al Hassan, has spent 12 years in the sport, however he originally started playing outfield before he discovered being a keeper was his passion. “I was the third backup keeper for the team back in 2010 when we participated in a tournament in Qatar,” he said. According to Mr Al Hassan, he was only 14 years-old when he attended this tournament and his purpose was to just watch and learn, never to participate. However, during the first period the team’s first keeper was injured, followed by the second keeper conceding an injury in the second period. This left the team no option but to resort to the young inexperienced goal keeper, Mr Al Hassan, who rose to the challenge. “I could not believe it when we won first place after I subbed in for the original goal keepers and finished the remaining five games of the tournament,” he said. “That tournament was one of my most memorable and interesting experiences in the game since I started playing, especially since I was only 14 and the team relied on me,” he added. Fellow Bahrain Sharks goal keeper, 32 year-old Rashid Al Mutlaq, has also been goal keeper for the past 12 years. According to Mr Al Mutlaq, onlookers usually assume that the goal keeper has the easiest job on the ice rink as he appears to just stand idly covering the goal. “Our position is the toughest because we are constantly bending our knees at an inward angle and our gear is heavier than that of the rest of the players,” he said. He stated that the gear weighs approximately seven to eight kilograms by the end of the game due to water absorption from sliding on the ice. “We hope to create an official national team for the sport which allows us to compete internationally and win championships in Bahrain’s name,” he added. The 4-a-side games are currently played on the ice rink in Funland, which is 15m x 30m, as opposed to official ice hockey rinks of 30m x 60m used for 6-a-side games. The players hope that proper facilities can be introduced in Bahrain in the near future, especially since there is an increased interest in the sport especially among Bahraini youth and women. Last week’s games saw Muharraq Predators grab a 10 goal win against Isa Town Oilers who scored eight goals, while the Riffa Maple Leafs locked in a four goal lead against Manama Capitals beating them 12 to eight. Datsyuk won the Stanley Cup with the Detroit Red Wings in 2002 and 2008, and he won World Championship gold with Russia in 2012. And now he won Olympic gold with the Olympic Athletes from Russia in an overtime win in the final against Germany. Additioanlly, Datsyuk has won Olympic bronze (2002), World Championship silver (2010) and bronze (2005, 2016) and played in the World Cup twice (2004, 2016). Russia had six previous TGC members, including Valeri Kamenski, Alexei Gusarov, Vyacheslav Fetisov, Igor Larionov, Alexander Mogilny, and Vladimir Malahkov. Datsyuk is the first Russian to join since Malakhov & Mogilny in 2000 after winning the Cup with the Dallas Stars. 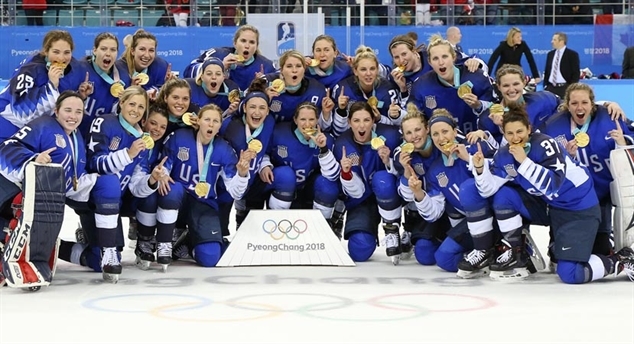 For the first time since the Unified Team of Russian athletes won the gold medal at the 1992 Olympics, the Olympic Athletes of Russia have won gold at the 2018 Olympics after an instant classic against Germany, a 4-3 overtime victory. Germany did a great job of holding on in the first period given the obvious skill level between the more physical, grinding German team and the fast, star-studded Russian squad. Danny Aus den Birken was the king of the night, making 12 saves in the opening period, including two big pad stops on Kirill Kaprizov and Pavel Datsyuk. But the Germans felt heartbreak with just 0.5 seconds left in the opening period. Nikita Gusev would find former Los Angeles Kings defenceman Slava Voynov a few feet in from the blue line, with Voynov unleashing a hard shot past Aus den Birken to make it 1-0 Russia. The Germans couldn’t compete with Russia in the skill department, so they’d need to do anything they could to grind out a goal like they had been able to do all tournament long. At 29:32, that’s exactly what they did after Felix Schutz got a weak backhand through the blocker arm of Vasili Koshechkin and in, tying the game at one just before the halfway point of the game. As if the pressure wasn’t already against Germany, no team had ever lost their first two round-robin games at the Olympics and gone on to win gold. So when Russia scored at 13:21 in the third period to put the pre-tournament favourites back in front, the Germans would need a bit of luck. Gusev would get his second point of the night after forcing Aus den Birken to flinch with a shot near the goalie’s head, putting Russia up by one with time running out. But 10 seconds later, the Germans knotted it up at two. Dominik Kahun, a former OHL star with the Sudbury Wolves, scored on the one-timer in front of the net after Frank Mauer found him in front, with the young German hockey star giving the underdog nation a chance late in the game. 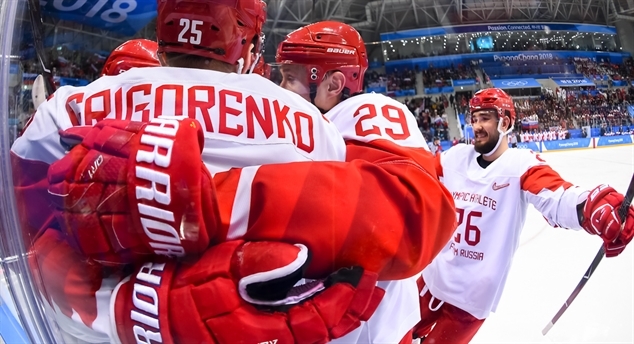 Russia looked so overpowered heading into the tournament, but that didn’t matter on Sunday. With three minutes to go, Jonas Muller scored the biggest goal in German hockey history when he scored on a hard shot in the high slot, beating Koschechkin to make it 3-2 and put the Germans in the lead. It was Muller’s first ever Olympic point, and after sitting out a game early in the tournament, it was the most important goal Germany had ever scored. But with 55 seconds left, Gusev, Russia’s best player in the medal round, tied the game up at three. He scored from a nearly impossible angle just a few feet away from the net, somehow beating Aus den Birken while Russia had their net empty to make it 3-3, sending the game to overtime. One of the greatest games in Olympic history required extra playing time to decide the winner, with both nations looking to get their first gold medal in their current forms. Russia was close with 13 minutes left in OT when Kovalchuk broke in all alone, making a quick deke on Aus den Birken. Kovalchuk thought he beat Aus den Birken on the play, but the German netminder made an incredible left pad save to keep the puck out and keep his team in the game. Kirill Kaprizov, Russia’s star player at the World Juniors a year ago, would get the job done in overtime. Gusev would grab his fourth point of the night after feeding Kaprizov to the left of the German net, one-timing a hard shot to give the Olympic Athletes of Russia the gold medal, the first time a Russian team has done so since the fall of the Soviet Union. Canada has won their third bronze medal in men’s hockey action in Winter Olympic history, joining the 1956 and 1968 teams with a 6-4 victory over the Czech Republic in PyeongChang, South Korea. It was a big result for Canada, who lost a shocking 4-3 game to Germany on Friday to eliminate them from contention for the Olympic gold medal for the first time since 2006. For the Czechs, they weren’t able to replicate their success from the round-robin where they defeated Canada in the second game of the tournament for both nations. For the first time in the Olympics, the Czech Republic found themselves allowing three goals while Pavel Francouz was standing it net. It all began at 8:57 on the power play, Andrew Ebbett scored after missing the past few games with a leg injury when he tipped in Mat Robinson’s shot in front of the net, beating Francouz to make it 1-0. But 16 seconds later, the Czechs tied it up at one. The record holder for most points in a single Czech league playoff run, Martin Ruzicka tied it up after Kevin Poulin let out a big rebound, tapping in the shot originally taken by Roman Cervenka to make it 1-1. But only 15 seconds later, Canada took back the lead after some frantic back and forth action. This time, Chris Kelly scored his first goal of the tournament after Cody Goloubef’s shot from the point was tipped at the last second by Canada’s captain, with Kelly putting Canada back out in front to make it 2-1 after some exciting action at both ends of the ice. Neither team could score again under 45:50 of the contest. Ebbett would grab his second goal of the game after tipping in a feed from Brandon Kozun from near the corner, re-directing the disk over Francouz to make it 4-1. Just over 30 seconds after that, the Czechs got their second of the night. This time, Jan Kovar scored a controversial goal after launching a wrist shot over Poulin on a delayed penalty call. The Canadians argued that the play should have been waved off after two defenceman touched the puck before the shot was taken, but the goal would stand. Canada would score one right afterwards to put the game out of reach for the Czechs. Kelly would get his second of the contest after Rob Klinkhammer won a battle in the corner and got the puck out to Kelly, who stepped into the wrist shot from the slot to make it 5-2 for the two-time defending Olympic champions. Roman Cervenka would get two goals late for the Czechs, but Wojtek Wolski would also pot one to help Canada come away with a bronze medal in PyeongChang thanks to a 6-4 victory on Saturday. After not even making the Olympics back in 2014, Germany will play for their first-ever gold medal after beating two-time defending champions Canada 4-3 in a thrilling semifinal game on Friday. The win means Germany will play Russia on Sunday for the championship, besting their third-place finish back from 1932, and West Germany’s same result from 1976. The win is Germany’s first since 1996 in a major tournament, a big difference from their 8-2 loss to Canada with NHLers back in 2010. The biggest storyline heading into the game was that Canada would not be able to use Ben Scrivens after a shoulder injury that took him out of the game against Finland sidelined him for Friday. Canada’s starting goalie for the entire tournament would be replaced by Kevin Poulin, who, after leading his country to the Spengler Cup championship in December, hadn’t allowed a goal in four per-tournament and Olympic contests, including five shutout periods against Korea and Finland. But his tournament shutout streak would end at 14:43 in the opening period. With two Canadians in the box, Brooks Macek made it 1-0 Germany after taking Dominik Kahun’s pass and using David Wolf as a screen in front of the net, beating Poulin on the wrist shot to give Germany the advantage. Five minutes into the second period, Canada found themselves playing some of their worst hockey of the tournament and trailing the Germans 2-0. This time, Matthias Plachta scored on a transition play after taking a feed from Patrick Hager, beating Poulin with the wrist shot to put Canada in a dangerous spot. If Canada thought things couldn’t get worse, they did. At 6:04, Frank Mauer converted on a great pass from Marcel Goc, taking any wind that Canada had in their sails to make it 3-0, a lead that looked to be too much for Canada. Or so they thought. Two minutes later on the power-play, Gilbert Brule made it 3-1 after unleashing a hard one-timer past Danny Aus den Birken, giving Canada some hope after the worst start to a game they’ve had in Pyeongchang. But Germany wasn’t about to let Canada put themselves back in the game. At 12:31, Patrick Hager would get credit for re-directing a shot from Matthias Plachta just three seconds into a power-play opportunity, giving Germany their three-goal advantage back and putting Canada in a tough position heading into the third. Canada needed a goal to kick off the third period to give them any hope, and with 2:42 done in the period, Mat Robinson scored Canada’s second goal. Robinson would use his speed to break into the German zone before taking a pass from Christian Thomas. Robinson would proceed to use his extra space to cut towards the net and backhand the puck over Aus den Birken, cutting the lead back to two goals. One of Canada’s best players of the tournament was Derek Roy, but heading into the third period, he had still yet to find the back of the net. That all changed at 49:42 on the power play when Chris Lee made a nice move around a defenceman before setting up Roy for his second point of the night. Roy would bounce the puck off a skate in front of the net, beating Aus den Birken to make it 4-3, giving Canada all the momentum in a tight game. It wouldn’t do enough to change the course of action for Canada, who would lose a stunning 4-3 game to Germany to put them in the bronze medal game. The OAR team will face the winner of the Canada-Germany semi-final on Sunday at 13:10 at the Gangneung Hockey Centre. Nikita Gusev, Vladislav Gavrikov and Ilya Kovalchuk scored for Russia, and towering netminder Vasili Koshechkin, who has allowed just five goals in five games, got his tournament-leading second shutout. Shots favored the Czechs 31-22. No Russian team has won gold at the Olympics since the CIS (Commonwealth of Independent States) team at the 1992 Albertville Olympics — or even made the final. The 1992 team starring Vyacheslav Bykov and Andrei Khomutov defeated the Canadians with Eric Lindros and Joe Juneau by a 3-1 score. On balance, coach Oleg Znarok’s team has met expectations here in PyeongChang. With NHL non-participation, 2018 is a prime opportunity for them to take top spot with their glut of KHL talent. Paced offensively by SKA St. Petersburg’s Gusev and Kovalchuk and CSKA Moscow’s Kirill Kaprizov, the Russians lead the Olympics with 23 goals. After a sloppy 3-2 opening loss to underdog Slovakia, they have trampled their opponents with four straight wins, including 8-2 over Slovenia, 4-0 over the U.S., and 6-1 over Norway. 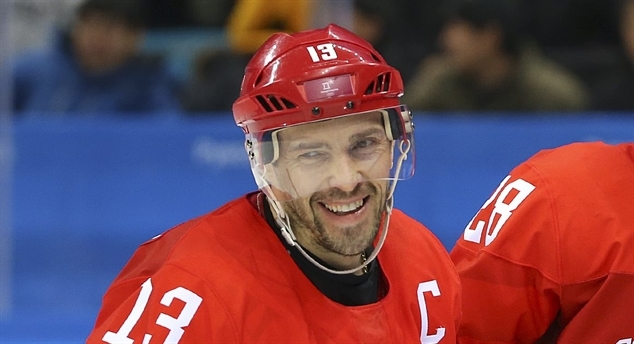 2018 captain Pavel Datsyuk (Stanley Cup 2002, 2008 and Worlds gold 2012) is now one win away from joining the IIHF’s Triple Gold Club. The Czechs have only one Olympic gold, the historic 1998 Nagano triumph at the first “NHL Olympics.” In that final, Petr Svoboda’s 1-0 goal won it and MVP Dominik Hasek got his second tournament shutout, throwing their Central European nation into ecstasy. But there will be no chants reminiscent of “Hasek to the Castle!” this month in Prague. The last time the Czechs faced a Russian team in the Olympic playoffs, Tomas Vokoun earned a 28-save shutout in a 3-0 bronze-medal victory in Turin 2006. At least the Czechs still have a shot at repeating that feat against the loser of Canada-Germany. They have proved resilient and canny so far, winning three out of their four previous games by one goal, including a 3-2 quarter-final shootout win over the U.S.
After a scoreless first period, Gusev opened the scoring at 7:47 of the second from the left faceoff circle, converting a cross-ice feed from Datsyuk past goalie Pavel Francouz. The Czechs challenged the play for goalie interference, claiming Kaprizov was the culprit. But video review showed the 20-year-old winger, who led the 2017 World Juniors in scoring, didn’t make contact, and the goal stood. It was the second goal of the tournament for Gusev, who is second in Olympic scoring with eight points behind Finland’s Eeli Tolvanen (nine points). “Of course it was important to open the scoring, because it was a tense game and everyone was afraid of making a mistake,” said Datsyuk. At 8:14, the Russians struck with cobra-like speed to make it 2-0. Ivan Telegin raced down right wing and lifted a perfect backhand saucer pass over blueliner Adam Polasek’s stick to Gavrikrov. The 22-year-old SKA defenceman beat Francouz high to the stick side. Kovalchuk, not always disciplined, threatened his team’s momentum when he promptly took a kneeing minor on Jan Kolar. After the Czechs hemmed in the OAR squad but couldn’t score with the man advantage, Kovalchuk rushed back on and slashed the stick out of Polasek’s hands. The man who sparked Russia to gold at the 2008 and 2009 Worlds returned to the sin bin – but again “Kovy” dodged a bullet. Trailing by two was a bitter pill for the Czechs, who outshot their opponents 15-8 in the second period. And despite pressing valiantly in the final stanza, they could not solve Koshechkin, who has backstopped Metallurg Magnitogorsk to two KHL titles (2015, 2016). Kovalchuk added the empty-netter with 21 seconds left, tying him with Tolvanen and the U.S.’s Ryan Donato for the Olympic goals lead (five). Russia’s last Olympic hockey medal was bronze in Salt Lake City 2002. A three-time KHL Coach of the Year and Gagarin Cup champion, Znarok has had declining returns with the national team, but will reverse that trend in Korea. At the Worlds, the mustachioed 55-year-old bench boss earned gold in 2014, silver in 2015, and bronze in both 2016 and 2017. It could be time for him to usher in a new golden era in Russian hockey. February 22, 2018 / NationalTeamsOfIceHockey / Comments Off on USA WINS GOLD! In fact, the shootout mirrored the game exactly. The U.S. led 1-0, trailed 2-1, and fought back to win both, 3-2. The U.S. goalie, 20-year-old Maddie Rooney, outduelled Canada’s two-time Olympic gold medallist Shannon Szbados to secure the win. Lamoureux’s winning shootout shot was, as they say, sick. Moving in slowly, she made a couple of left-to-right dekes that had Szabados on her back. The U.S. men won their only gold medals 20 years apart (1960 and 1980), and the women have now done the same thing. They won in 1998 in Nagano, but not again until today. They have now won all top IIHF tournaments since 2015, including three Women’s Worlds and this Olympics. Canada’s run of Olympic golds ends at four, but this was another classic between these great rivals who simply refuse to give an inch and refuse to give up. In the end, Canada’s conservative play in the third period cost them as they tried to defend a 2-1 lead. The Americans struck for the tying goal by capitalizing on a bad Canadian line change which left Monique Lamoureux wide open on the left wing. She went in on goal and wired a shot over Shannon Szabados’s glove at 13:39 to tie the game and set the stage for extra time. The play actually started at the other end of the ice when Canada’s Laura Stacey came down on a two-on-one. Her shot to the far corner went off the shaft of goalie Maddie Rooney’s stick, and the Americans made the transition from defence to offense in a blink. The overtime was pressure-filled, and the Americans carried the play for much of it. Megan Keller had a clear break, only to be stopped by Szabados, and with 1:35 to play the Canadians had a power play. At the side of the net, Rebecca Johnston came close, but couldn’t convert. In the shootout, Gigi Marvin scored on the first shot but Meghan Agosta came right back to tie it. Two shots later, Canada went ahead on a goal from Melodie Daoust, the tournament MVP, but on the fourth American shot Amanda Kessel scored. After five shots, teams were tied 2-2, and the order was reversed. On the first extra shot, Jocelyne Lamoureux scored, and Agosta, shooting again, couldn’t tie it. The Americans won gold. The game started with extreme caution and care as neither team wanted to give the other an early advantage. The first shot of the game didn’t happen until 3:41 (Canada), and the Americans didn’t get their first until 7:48. Once the preliminaries were done with, though, the Americans spent much of the rest of the period on the power play as Canada was whistled for the only three infractions of the opening 20 minutes. Canada did a masterful job of killing penalties, but given the firepower on the U.S. side, this couldn’t last forever. In the final minute, a Sidney Morin shot was tipped by Hilary Knight past Szabados, with 25.4 seconds remaining, breaking the ice and giving the U.S. a 1-0 lead. That lead didn’t last long. Canada tied the game on the merits of great hustle and great hands. Blayre Turnbull did the hustling, chasing down her own shoot-in and firing a high shot to the net for the corner boards. The hands came to the fore when Haley Irwin batted the puck out of the air from in tight, batting it in at 2:00. But no sooner had they tied the game than they were called for a fourth straight penalty. After killing that off, they went back to the attack and took the lead. Morin lost the puck at centre ice and Agosta tore down the left wing. As players from both teams skated to the goal, Agosta calmly passed back to Marie-Philip Poulin, the trailer, and she snapped a shot short side that beat a screened Rooney. Canada nearly made it 3-1 when it finally got a power play midway through the period, but Jennifer Wakefield couldn’t find the puck in her skates. The rest of the period was back and forth. The Americans had the better of puck possession, but Canada looked the more dangerous. In the end, the U.S. persevered and the Canadians made a mistake and later couldn’t convert at the right time. Hats off to the gold medalists! The journey is over for 2018, and a new one starts tomorrow for 2022 in Beijing. Patrick Reimer was the hero for Germany, giving the team that was ranked ninth-place in the round-robin a shocking 4-3 victory against the top-ranked Swedish team to advance to the semifinals. Germany had never previously beaten Sweden at a major men’s competition, having only recorded two wins against the boys in yellow in exhibition contests in 2013 and 2016. The victory put them in the final four for the first time since 1932, a major accomplishment for a team that had to play their way into the 2018 tournament in a qualification event back in 2016. Unexpectedly, Germany found themselves up by two goals early in the contest in a shocking start for the Tre Kronor. At 13:48, a power-play blast by former NHL defenceman Christian Ehrhoff made it 1-0 after the big blueliner took a pass from Patrick Hager, beating Viktor Fasth to make it 1-0. 29 seconds later, the Germans shockingly opened up their lead further. This time, Marcel Noebels was the beneficiary of a loose puck in front of the net. Noebels, a former Philadelphia Flyers prospect, would grab his first Olympic goal after pouncing on the disk before either Swedish defender could turn around and scoop it away, with Noebels knocking it past Fasth to make it 2-0 Germany. Sweden was unable to change the score at the 40-minute mark, putting them in desperation territory. It was becoming to look like shades of 2002 when Sweden lost to Belarus in the quarterfinals, a team Sweden should have had no issue rolling over. They had already beaten Germany earlier in this tournament, but with a 1-0 victory coming off of the first shot of the game, there wasn’t a lot of confidence that the Swedes could reverse the deficit. But they still found a way to score twice. At 6:25, top NHL Draft prospect Rasmus Dahlin, who had seen just two shifts prior to Sweden’s goal, took a shot from the point that landed in front of Danny Aus den Birken. Anton Lander was there to scoop up the puck and beat the German goaltender, giving Sweden their first of the game. Then, at 9:35, Patrick Hersley one-timed a pass from Linus Omark on the man advantage to put the Swedes back within one, just a minute after Dominik Kahun scored Germany’s third goal of the contest. Germany was doing everything they could to hold on, but at 11:37, the Swedes tied it up for the first time in the game. Mikael Wikstrand would do the deed, sending a perfect wrist shot over Aus den Birken’s glove to make it 3-3, making an exciting game even closer late. The game would require overtime, the second game to do so in the quarterfinals. Reimer came up huge when it mattered most, scoring shortly after the puck dropped to give Germany the shocking 4-3 victory and a spot in the semifinals on Friday against Team Canada.